Dr. Payman Kakoli earned his bachelor's degree in biology from the University of Maryland before graduating from the University of Maryland School of Dentistry with a doctorate degree in dental surgery. Afterwards, Dr. Kakoli completed his general practice residency at Baltimore's Department of Veterans Affairs Medical Center. Following completion of his general practice residency, Dr. Kakoli returned to the University of Maryland for advanced postgraduate studies, where he completed a residency in the specialty of endodontics. Before leaving University of Maryland, Dr. Kakoli also earned a master's degree in the field of biomedical sciences. During his dental studies, Dr. Kakoli earned a number of awards and honors, including membership in the esteemed Omicron Kappa Upsilon Honorary Dental Society and the Harry E. Latcham Memorial Medal for Excellence in Complete Oral Restoration. 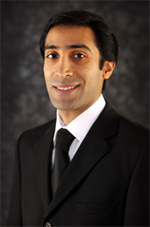 As a well-known expert in endodontics in Los Angeles and a member of the American Dental Association, the American Association of Endodontists and the California Dental Association, Dr. Kakoli is a national presenter of cutting-edge endodontic subjects at annual sessions of the American Association of Endodontists. Recently, The Journal of Endodontics, a highly respected trade journal of research in the endodontic field, has published studies performed by Dr. Kakoli. In the Los Angeles area, the quality of endodontic care we offer at Endodontics Los Angeles sets our group apart. We acknowledge the pain that can accompany damaged and infected teeth and how debilitating it can be. Our endodontists work tirelessly to save teeth from extraction and preserve the smiles of our patients. Our goal in establishing this network of endodontists is to provide conveniently located treatment for patients located throughout the Los Angeles area, including West and North Hollywood, and El Monte. Access to root canal surgeons in Southern California is not always easy to find, but with Endodontics Los Angeles, patients can easily contact us through our site to discuss endodontic treatment or schedule a consultation. Patients are then put in touch with an experienced doctor at the location closest to them.